ROTTERDAM, SOUTH HOLLAND, NETHERLANDS, April 3, 2019 /EINPresswire.com/ -- Leapest Corporate Learning Marketplace, an EdCast company, continues to expand its catalog, with its customers now gaining access to the robust training content from itSM Solutions, an accredited content publishing company specializing in the creation of digital transformation training curriculum for Cybersecurity, Information Technology (IT) and Digital Transformation (DX) professionals. itSM Solutions is a global consortium of academic, government and industry thought leaders working together to create Digital Transformation (DX) training curriculum based on the frameworks, methodologies, and technologies created by the National Institute of Standards and Technologies (NIST) and other internationally recognized institutes and organizations. The NIST Cybersecurity Professional (NCSP) training curriculum was created in partnership with digital transformation thought leaders including UMass Lowell (UML) a NSA/DHS National Center of Academic Excellence in Cyber Defense Research (CAE-R). The NCSP certification training curriculum was featured in the National CyberWatch Center 2018 Innovations in Cybersecurity Education magazine. The NCSP curriculum also won the ISE North America Project Award for the Academic and Public-Sector Category, 2013. 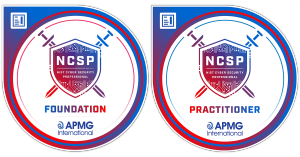 - NCSP curriculum is based on the NIST, NICE and other industry cybersecurity frameworks and is focused on creating the engineering, operations, business risk and specialist workforce required to help organizations protect, detect, identify, respond and recover from cyber-attacks. - NCSP online Train-the-Trainer program enables training partners to quickly stand-up its own delivery and mentoring force. The NCSP training curriculum can be delivered in an instructor-led classroom, virtual classroom or blended classroom. The program can also be delivered as a standalone self-paced video training program. Print, Digital Book and Video versions of the training content are available in the Leapest Corporate Learning Marketplace. “The rapid pace of digital transformation has created a strong demand for skilled workers to secure, maintain and improve digital infrastructures and cyberspace. This partnership with Leapest with its customer base of training providers as well as enterprises from 100+ countries helps to quickly create and continually improve the global IT, Cybersecurity and Digital Transformation workforce,” says Rick Lemieux, Co-Owner, Chief Revenue Officer, itSM Solutions. “Leapest, an EdCast company, has a strong mission to help organizations around the world to upskill and reskill the workforce in Industry 4.0. Partnering with industry leaders like itSM Solutions enhances our offerings for organizations looking to identify their skill gaps and improve their capabilities as they go through their digital transformation journeys,” says Sukhbir Jasuja, CEO Leapest by EdCast. Leapest offers a Corporate Learning Marketplace for training resources including courseware, eLearning, business simulations, certifications and instructor service. Our current catalog features key topics in IT training. Leapest provides the ease to a comprehensive portfolio of in-demand training topics. Architected for agility, scalability, and reliability, we focus on building and enriching an ecosystem in corporate training. itSM’s curriculum solutions have been adopted by the who’s who of industry including HPE, Disney, Cisco, IRS, Navy, Staples, Genzyme, Boeing, Intel, Molina Healthcare and many others.